When the United States entered World War I in April of 1917, it had more soldiers than guns. A shortage of rifles, machine guns and howitzers forced the American soldiers arriving in Europe in 1917 to use French and English weapons. 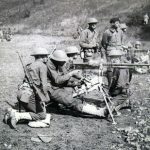 A photo taken by the Photographic Section of the French Army documents an American machine gun team training with a French Hotchkiss M1914 light machine gun. The photo is one of more than 400 World War I images in the collection of the Nevada State Museum and it is part of a new exhibit at the museum in remembrance of the centennial of the United States’ entry into World War I. 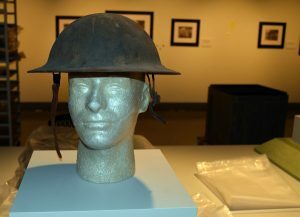 “Remembering the Great War: 1914-1918,” was unveiled in April in the museum’s South Gallery and will remain in place for at least a year, museum officials said. 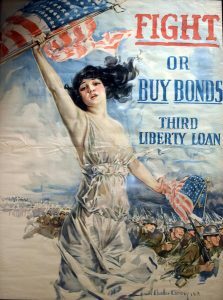 The exhibit features artifacts ranging from patriotic posters to a U.S. Army captain’s uniform from the balloon corps to helmets to a silent film of American troops in France. The centerpiece is the photographs, which are both a treasure and a bit of a mystery. Museum curators know who took the photos, where they were taken and information about each image. Curators also know how the photos ended up in the museum’s collection – they were part of a larger collection acquired from Carson City history buff and collector Daun Bohall, who had purchased them years earlier at a yard sale. How the photos went from France to a Carson City yard sale is the mystery. The photographs were all taken by the Photographic Section of the French Army. It was created in 1915 to counter German action against neutral countries while supporting the services of the Ministry of Foreign Affairs. The photographic section of the army hired photographers to go out and document the war. Many of the photos also came with information on the back, but that, too, offered a challenge as the writing was in French. Museum officials were able to find a volunteer who translated it to help with writing the captions for each image. The uniform, helmets and other memorabilia will be in display cases inside the gallery. Even as the exhibit was coming together, a staff member of the state museum brought in a photograph of her grandfather, who served in World War I. “We think when people see this exhibit or learn about it, they might have their own memorabilia they might want to share, so some of these display cases might be changed or added to during the course of the exhibition,” Nylen said. There were 116,798 Americans who died in the war, including 197 from Nevada. The state’s namesake and storied battleship – the USS Nevada – was launched during World War I, and while it did not see battle, it was part of the fleet that escorted President Woodrow Wilson to France for the signing of the treaty that ended the war. Museum visitors can also see the USS Nevada collection. Museum hours are 8:30 a.m. to 4:30 p.m. Tuesday through Sunday. Admission is $8 for adults and free for children 17 and younger. For more information, visit http://nvdtca.org/museums/.